At least there's still a bit of overlap...note For those interested, inside the intersection of the circles lies the Democratic Republic of São Tomé and Príncipe, the Democratic Republic of Timor-Leste, the Democratic Socialist Republic of Sri Lanka, the People's Republic of Bangladesh, and the Federal Democratic Republic of Nepal  and the last two have had some trouble staying in the overlap. Foreign Office Official: Its full name is the People's Democratic Republic of East Yemen. Sir Humphrey: Ah I see, so it's a communist dictatorship. When The Empire tries to masquerade as The Republic or The Federation, it will often adopt a democratic-sounding name in the process. But often it will go overboard, unable to restrain its own sense of self-importance. While the true federations around it will usually possess simple, unassuming names  The Federation, The Republic, etc.  the People's Republic of Tyranny will call itself the People's Republic. If they are really evil and oppressive, they'll call the nation the Democratic People's Republic. Indeed, the more words implying freedom the name of this "republic" sports, the more oppressive and generally un-free it is likely to be. Some regimes will continue this Theme Naming to important buildings and organizations. As a corollary, be wary of any movement, government, or country that is casually referred to by its leaders as "Glorious". The leaders might be cultivating themselves as a Villain with Good Publicity. Or they may genuinely believe that their society is genuinely democratic, even more so than (so called) real democracies. Who knows; if they give everyone Bread and Circuses and are Repressive, but Efficient, people might not even care. Truth in Television: North Korea, for example, is officially the Democratic People's Republic of Korea, and it is one of the most repressive, totalitarian governments in the world. A form of Newspeak. A subtrope of Super Happy Fun Trope of Doom. Definitely Names to Run Away from Really Fast if you can. Given what these governments tend to have at their disposal, that's a big "if". It is often headed by The Generalissimo and/or Just the First Citizen. If they go so far as to have "elections", see Corrupt Politician. If it's the "Republic" part that's doubtful, see Hereditary Republic. Compare Banana Republic, Day of the Jackboot, and A Nazi by Any Other Name. See also Double Speak and Suspiciously Specific Denial. Bane turns Gotham City into this during The Dark Knight Rises, complete with Kangaroo Courts reminiscent of the French Revolution (this link is quite explicit, as Commissioner Gordon actually quotes A Tale of Two Cities at one point, and in an interview, we learn that Jonathan Nolan actually encouraged Christopher Nolan to read the book while he was writing the script). The wealthy are dragged out of their homes by angry mobs of armed criminals and summarily sentenced to death by a kangaroo court led by Jonathan Crane... a.k.a. the Scarecrow, who icily informs every defendant that "Your guilt has already been determined; this is merely a sentencing," where it turns out that both sentences are actually the same thing. Bane declares that this is a "liberation" and that he's a champion of "the people". The audience isn't fooled, as he already made his real nature painfully clear to Batman earlier in the film. Lord of War: Discussed when Yuri visits a group of "Freedom Fighters" in war-torn Sierra Leone to discuss an arms deal. Yuri: Every faction in Africa calls themselves by these noble names  Liberation this, Patriotic that, Democratic Republic of something-or-other. I guess they can't own up to what they usually are: a federation of worse oppressors than the last bunch of oppressors. Often, the most barbaric atrocities occur when both combatants proclaim themselves freedom-fighters. The Federation in Starship Troopers, the full name of which according to background material is apparently the "United Citizens' Federation". Whatever else it is, it's clearly not a federation, since power resides in a highly centralized military bureaucracy; the effective head of the state appears to be the Sky Marshal. Only Citizens (which is a privileged status one has to earn; there are a few ways to do this, but military service is the easiest, as the news films proudly declare "SERVICE GUARANTEES CITIZENSHIP") are allowed to vote, you need a license to breed (Citizens can obtain a license more easily), murderers are arrested, tried and executed the same day, the media is nothing but government-owned propaganda, and everyone is horribly desensitized to violence. That said, things don't seem too bad for non-Citizens, though we only see the wealthy ones. The Galactic Republic in the prequels. As the Clone Wars drag on, the Republic becomes a military dictatorship in all but name. Palpatine becomes the only voice of authority, and all worlds have a regiment of clone troopers for "protection". When he finally declares the formation of the First Galactic Empire, it's really just a formal change in name. The Confederacy of Independent Systems, in various materials, is established as having been founded on the ideal of breaking away from the corruption of the Old Republic and founding a freer society. In point of fact, it was founded by a group of Mega Corps that wanted to strike out on their own (and were even responsible for most of the corruption in the Republic) and two Sith Lords, one of whom was Palpatine. Pretty much every story featuring them portrayed them as somewhere between a Banana Republic and the Legion of Doom. Given the name "Confederacy" is shared with a real historical breakaway of questionable morals, the points made may or may not be allusions to that particular phase of American history. A few Separatists do honestly believe they're fighting for freedom from the tyranny and corruption of the Republic, and some of the politicians think they are a democracy, but are unaware that it's really the Separatist Council and the Sith Lords that are calling the shots. Most of their forces, however, are from the mega-corps, or local political dissidents seizing on it as an opportunity to settle old scores with their regional rivals. 24: The Islamic Republic of Kamistan has the trope averted: they are a functioning democracy, albeit one plagued by instability (making them sort of a stand-in for Pakistan since Musharraf's resignation). 30 Rock: Jack refers to San Francisco as "The People's Gaypublic of Drugafornia". Angel: Possible Averted Trope. The Groosalugg is exiled from Pylea once it becomes (as Gunn described it), "some kind of people's republic". Although this is a reference to what often happens in the sort of failed revolution that often produces people's republics (i.e., old revolutionaries are branded traitors for disagreeing with the faction that wins), we never find out what Pylea is now like. Blake's 7: The Terran Federation definitely qualifies as this, being ruled by a president and high council whose usual method of seizing power seems to be a military coup and with populations largely kept drugged and complicit. Ironically, the term "people's republic" is actually used by a revolution led by former Federation agent Anna Grant, who probably wouldn't have been much better than Servalan, or at least her predecessor, if the rebellion had succeeded. Doctor Who: The parallel universe Britain where Rose ends up calls itself a "people's republic", which gets a reaction from the audience similar to the page quote above. They may be an aversion, but their Britain is ruled by a president who seems to be at best a benign dictator and has shadowy government organisations that seem to be able to take whatever they want to carry out their plans. Flash Gordon: Ming's authoritarian state is called "The United Peoples of Mongo". Mission: Impossible: Whenever the team was off to Eastern Europe, it was usually operating in the People's Republic of Something. The Prisoner (1967): The Village is allegedly run by the Citizens' Council (which is always referred to by the administration as "your Citizens' Council"), and the various Number Twos are always quick to loudly proclaim the Village's democratic nature. In reality, the Citizens' Council is a bunch of brainwashed mental vegetables who rubber-stamp whatever the current Number Two says and the post of Number Two itself is seen filled by a rigged election whose results are overturned as soon as they no longer serve the purposes of the Village's true rulers. QI: In one episode, Jimmy Carr joked that countries describing themselves as "the Democratic Republic of..." rarely live up to their name. Conversely, a country describing itself as "the Fascist Junta" should be respected for its honesty. Red Dwarf: Though it's never named, the totalitarian state in the Despair Squid's hallucination has the trappings of one of these. There are election posters which reveal that the Fascist party has been in power for three straight decades. A black-suited government agent attempts to shoot a child for stealing "an apple of the people" and addresses the crew as "voters." Then Lister is revealed to be the Voter-Colonel, who purges people in order to "purify" the voter rolls. Revolution: The Monroe Republic is implied to be this, considering that their military force consist of militias who force their citizens to pay taxes with food. Given this throwback to feudalism, and with Monroe leading what appears to be nothing more than a military dictatorship, it's a republic in name only. "The Night the Lights Went Out in Georgia" shows that the Georgia Federation seems to be a much better place to live, with steam-powered technology, wealth, international trade, and commerce. The episodes "Home", "The Love Boat", and "The Longest Day" show that the Plains Nation is essentially made up of nomadic tribes living like Plains Indians, but without the racist implications. The friendliness in that area depends on the tribe you encounter. Yes, Minister: Lampshaded this, with "East Yemen" playing the role of the People's Democratic Republic of Yemen, better known as South Yemen, which (much the way West Virginia is north of Virginia) was geographically east of the Yemen Arab Republic/"North Yemen". The "era-specific title" of John Laurinaitis's regime as general manager of both Raw and Smackdown is called "People Power". An episode of Think the Unthinkable featured the team at Unthinkable Solutions scheduled to meet with the Minister of Finance for the fictional African state of Nambitrea. Sophie: Formerly the Democratic Republic of Nambitrea, when it was Communist. Ryan: And before that it was the Nambitrean People's Republic, when it was Fascist. Sophie: And before that it was called New Devon, when it was completely owned by Lord Brinkworth. In the BattleTech universe, the five major states are called the Lyran Commonwealth, the Draconis Combine, the Federated Suns, the Capellan Confederation, and the Free Worlds League. The galaxy's Golden Age came about under the rule of the Star League, which was brought down by the machinations of the Rim Worlds Republic. All of these states are feudal monarchies. But not all are exactly tyrannies. The Federated Suns and the Lyran Commonwealth, for ex, are relatively civilized and mostly law-governed places, the power of the monarch is not absolute in practice, even if it is in theory (they are not figureheads, but neither realm is a despotism, either). The Draconis Combine, OTOH, most certainly is an iron militarism, with harsh regimentation and all the nasty appurtances of a police state. The Free World League barely holds together, and Capella is somewhere in between the civilized monarchies and Draconia in terms of its freedom and decency rating with some authors portraying it as fairly free and others portraying it as extremely oppressive. Nor were the rulers of the collapsed Star League absolute monarchs, though they were most certainly monarchs. The applicability of the trope varies here. The Free Rasalhague Republic was ruled by a Prince elected by Parliament during its brief existence. After conquest by Clan Ghost Bear the Rasalhague Dominion managed to maintain some of its' democratic features, under the Clan's rule of course. Helped by their first Prince's son getting taken as a Bondsman and fighting his way up to saKhan of Clan Ghost Bear, and then being elected Prince himself. Eclipse Phase has the Jovian Republic...known to the entire outer system as the Jovian Junta, a repressive anti-transhuman state that views humanity as being far too immature to use Pandora gates or transhumanist technology safely, and accuses virtually every other power bloc in the setting of Transhuman Treachery. One of the example factions in Tomorrow's War is the Democratic People's Republic of Glory, "Glory" is the only part of the name that isn't a blatant lie, and only because it's the name of the planet they colonized. Their main enemy on Glory is the simply named Republic of Arden and their terrestrial allies include the PRC and Brazil (whose army is known as the "Brazilian National Liberation Army"). Cade: I thank you, good people  there shall be no money; all shall eat and drink on my score, and I will apparel them all in one livery, that they may agree like brothers, and worship me their lord. This can be invoked by players of web-based nation-building games like NationStates and Cyber Nation. The Democratic Republic of Sahrani from ARMA : Armed Assault. Also, Chernarus from ARMA II is a former bearer of this trope (and a certain political faction wants to return the country to that state). Then the zombies happened. Rapture in Bioshock was built to be a capitalist utopia free from religious and government interference, where anyone can achieve for his/her own gain rather than for the fulfilment of others, and where the artist need not fear the censor and the scientist need not be bound by petty morality. Too bad the man who built it, Andrew Ryan, was also a crazy hyper-capitalist who so strongly believed everyone had to be a Self-Made Man that he prohibited publicly funded social programs and altruistic charities, so everything in the city was privately owned, the poor were thought of as "parasites" and absolutely everything had a price tag on it, even basic necessities like food, water, sanitation and oxygen. This environment of completely unfettered dog-eat-dog economics alienated the worse-off citizens of Rapture and allowed a man named Frank Fontaine to make an absolute killing smuggling contraband from the surface. Ryan could not compete with Fontaine on even terms and this emerging threat to his power base pissed Ryan off to no end, so he founded a Secret Police force to seize Fontaine Futuristics by force, scuttling his entire philosophy in the process. Ryan didn't know at the time but for the rest of Rapture, this meant that Ryan can seize any business deemed too profitable, and this was the last straw. Ryan, a man who founded an underwater city built on the ideals of personal liberty, began cracking down ever harder on his citizens - first his police came for the smugglers, then they came for political activists, and eventually they came for the lounge singers who wrote mildly derisive songs about him. In the end, Ryan turned Rapture into a One Nation Under Copyright Not So Different from the collectivist states he so greatly despised. The less democratic your BLOC nation is, the harder its name tries to pass it off as a bastion of freedom. 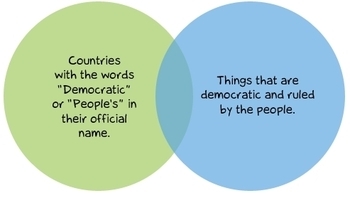 Authoritarian democracies are named "People's Republic of ___". One-party states are named "Democratic People's Republic of ___". Countries ruled by military junta are named "The Revolutionary Democratic People's Republic of ___". Dictatorships are named "The Great Revolutionary Democratic People's Republic of ___". Actual multi-party republics are simply called "Republic of ___". The Minmatar Republic of EVE Online rides this line to some degree. The Minmatar people, despite being a spacefaring civilisation with a reputation for technological innovation (i.e: building working spaceships out of scrap metal and duct tape), are very fond of their seven ancestral tribes, complete with elders and shamans and all that the word "tribe" might suggest. The current leader of the Minmatar Republic is Chief Maleatu Shakor of the Brutor Tribe, who goes by the title "Sanmatar". His predecessor was Prime Minister Karin Midular, chief of the Sebiestor Tribe. Shakor led the Republic parliament in a vote of no confidence that cost Midular her job, appointed himself Sanmatar when the Republic parliament folded in on itself and fell apart, and the result has been that the Minmatar have slowly worked their way towards a system more akin to a meeting of tribal elders under Shakor's leadership. Whatever the system might be called, it most certainly isn't a republic but they still call it that, presumably for lack of a more accurate term. In the Fallout franchise, the United States became this, under the corruption of a shadow-government cabal of fanatical, authoritarian, red-baiting right wing oligarchs called the Enclave. In Mass Effect, despite the Batarian government styling itself as a Hegemony, no-one in Citadel Space buys it. Planetside: The Terran Republic is in fact a conservative and authoritarian police state seeking to seize control of Auraxis by force and then reestablish contact with Earth. In the first game they also had elements of Those Wacky Nazis and were clearly the bad guys, but for 2 this aspect was dropped. The Commonwealth in Red Faction II. A commonwealth being essentially a republic, this one is nevertheless ruled by a dictator, then by another after a coup. The player can remedy this. In one developer demo for Tropico 4, the dev says "This island is the People's Democratic Republic of Tropico, which isn't democratic, isn't a republic and isn't for the people." Also in the game itself, where the Player Character's election slogan is: Vote El Presidente. Or Else. The Peoples Alliance for Common Treatment (or simply PACT) from Sunrider. Its leader Veniczar Arcadius is a former anti-Imperial revolutionary turned megalomaniacal galaxy-conquering dictator with a cult of personality, and PACT itself is heavily implied to be a communist state with several parallels to Soviet Russia. An in-joke revolving around Uru: Ages Beyond Myst is that DRC — the D'ni Restoration Council, the in-character face of the game company — secretly stands for the Democratic Republic of Channelwood. The website hosting Le avventure del grande Darth Vader plays with this in an article where the title character states he "freed" a newsgroup (actually, he just decided to post again into an abandoned newsgroup) and issues a "new manifesto" stating, in order: that the newsgroup is now a "democratic popular republic"; that he owns full legislative, executive and judiciary powers within the newsgroup; that ideas different from his own are always off-topic; and finally that he can delete off-topic messages any time. In Last Res0rt, Celigo's full name is the People's Republic of Celigo (often shorted to P.R.O. Celigo). Supposedly it's not a bad place to live... as long as you have wings, anwyay. A Miracle of Science has the People's Republic of the Moon, which isn't actually all that bad; it's a drab grey place, but then it was Luna to start with. (It's Venus, with no such nominative pretensions, that you really have to be careful visiting.) Luna is a communist state, whose economy is described in comic as "managed" and "a mess", where consumer goods flow like water (in order to show how prosperous it is) while essentials are often in short supply - everyone has sunglasses, but few have shoes. The Order of the Stick #698 has a map including a place called "People's Democratic Dictatorship". There's also the rather bizarre inversion in the form of Tyrinaria . Its ruler, Lord Tyrinar the Bloody, was a kind, benevolent man who genuinely wished for peace and prosperity. Tarquin disagreed with this idea. Due to his Global Ignorance, USA mistakes the relatively harmless Democratic Republic of the Congo for one in this ◊ Polandball comic. Imperium Nova: The United Federation of People's Republics, in Gemini, mostly a Fantasy Counterpart Culture of the Soviet Union, but with North Korean-style nepotism thrown in. During the Florida vote tabulation snafu between George W. Bush and Al Gore, The Onion ran an article where Bill Clinton took control of the United States and renamed it the "Holy United Imperial Americlintonian Demopublic". In the New Deal Coalition Retained timeline, China shifts from one form of this to another in the 90s when the communist regime is overthrown and replaced with a democratically-elected government that is really just a puppet system that answers to the military. In American Dad! near the beginning of the episode "Rodger Codger" is a sign for the fictional country "Republic of Balkavia" when the camera pans down you see that 5 people are hung from it. As a bonus the sign also says "Freedom, Peace, Unity". It turned out to be a CIA training course. In the episode "The Honeymooners", Sterling Archer Lampshades this trope after North Korean agents address their plans to send the captured Archer and Lana back to "The Glorious Democratic People's Republic of Korea". Archer: It's neither of those things; it isn't democratic, it isn't a republic, and it is definitely not glorious! Mallory often uses the sarcastic "People's Republic" epithet when referring to anywhere with a slightly more expansive welfare state than the USA — "The People's Republic of Canada" gets thrown around a lot in reference to their socialised healthcare. The Galactic Federation in Rick and Morty apparently has elected leaders, but seems to reserve all political power for a single species of Insectoid Aliens, is relentlessly expansionist, and turns its conquered planets into Police States with heavy Government Drug Enforcement. They conquer Earth in the second season finale, and then Rick destroys them entirely in the third season premier by devaluing their currency. The Transformers has the Socialist Democratic Federated Republic of Carbombya, led by Supreme Military Commander, President-for-Life, and King of Kings Abdul Fakkadi. The horribly offensive stereotyping provoked Casey Kasem to quit the show. That's right; it was a joke so awful and racist that it broke Teletraan 1.